The Madge Tate Award is a service award established in 1994 after the late Mrs Madge Tate who served as President, Secretary and member of the Croydon Auxiliary since 1932. Mrs. Tate overcame the difficulties of distance, family commitments and sometimes ill health to continue her dedication and extraordinary service to the Royal Children’s Hospital. She passed away in 1992 and this service award is now presented annually to a person who fits the shoes of this extraordinary lady. 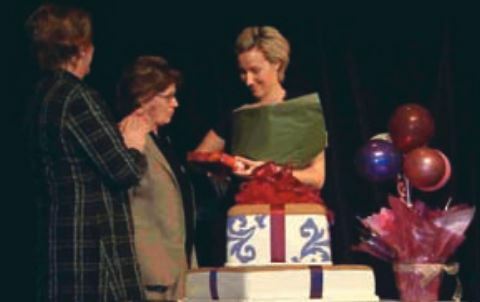 In 2007 our own living treasure Sandra Lehrer was presented with this great award. We congratulate Sandra on receiving this well deserved prestige award at the Auxiliaries 85th annual general meeting held on Saturday 4th August 2007 at the Zinc Restaurant on the banks of the Yarra, behind Federation Square. Sandra has been an active member of CIKA since 1998 and President since 2002 as well as acting on the Executive Committee at the RCH. Sandra has taken the CIKA team forward in such a positive way with her vast experience, talent and belief in her team.